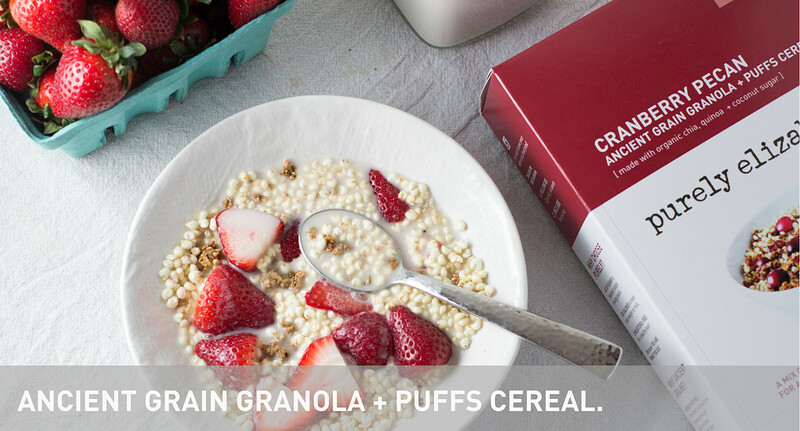 Purely Elizabeth of granola fame has a new cereal on the market: Ancient Grain Granola + Puffs Cereal. 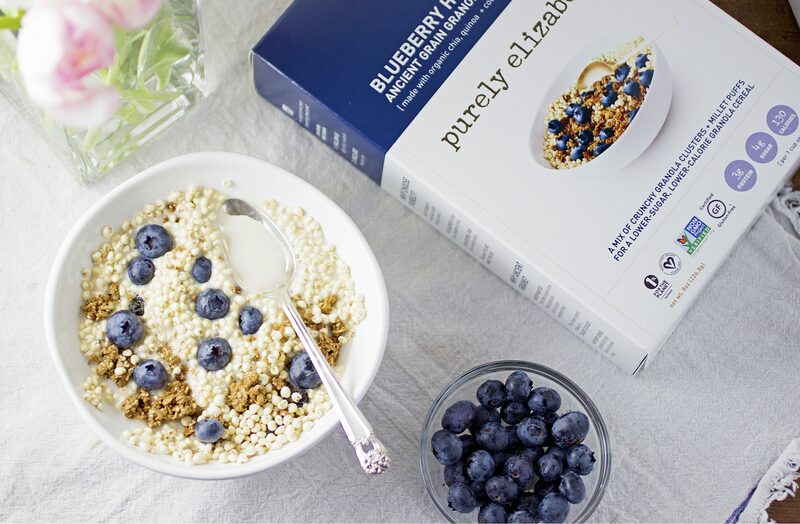 It’s the same award-winning, great tasting, and nutritious granola – Original, Blueberry Hemp, Cranberry Pecan, and Pumpkin Fig – but with nutrient-rich millet puffs added for a cereal that is high in nutrition but lower in sugar, calories and fat. Add fresh fruit – strawberries, blueberries, raspberries, kiwi, blackberries, bananas – for an unbeatable bowl of cereal. Blueberry Hemp Ancient Grain Granola + Puffs: oats, coconut palm sugar, raw virgin coconut oil, dried blueberries, puffed amaranth, quinoa flakes, sunflower seeds, hemp seeds, salba chia seeds, cinnamon, sea salt, and millet puffs. Original Ancient Grain Granola + Puffs: oats, coconut palm sugar, raw virgin coconut oil, puffed amaranth, quinoa flakes, sunflower seeds, hemp seeds, salba chia seeds, cinnamon, sea salt, and millet puffs. Cranberry Pecan Ancient Grain Granola + Puffs: oats, coconut palm sugar, raw virgin coconut oil, puffed amaranth, quinoa flakes, pecans, dried cranberries, sunflower seeds, salba chia seeds, cinnamon, sea salt, and millet puffs. Pumpkin Fig Ancient Grain Granola + Puffs: oats, coconut palm sugar, raw virgin coconut oil, puffed amaranth, quinoa flakes, millet flakes, pumpkin seeds, dried figs, sunflower seeds, salba chia seeds, cinnamon, sea salt, and millet puffs. 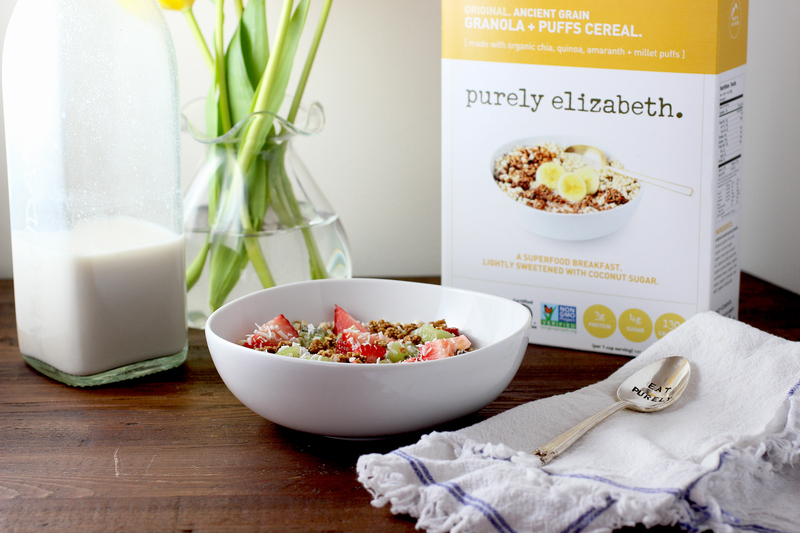 Purely Elizabeth Ancient Grain Granola + Puff Cereal is non-GMO verified, gluten-free, and free of refined sugar. Each 1/2 cup serving has 130 calories, 3.5-5 grams of fat, 3-4 grams of protein, 2 grams of dietary fiber, 4-5 grams of sugar (from the fruit and coconut sugar – a low glycemic, unrefined sweetener), and 80 mg of sodium. Available nationwide at Target stores or on-line at Purely Elizabeth (www.PurelyElizabeth.com), www.vitacost.com, www.luckyvitamin.com and most grocery on-line retailers. Each 8 ounce box sells for $6-$7. Photos: Courtesy of Purely Elizabeth.